Rafael Nadal seems ready to put this year behind him. His coach and uncle, Toni Nadal, told the DPA news agency that the ATP tour's No. 3 ranked player didn't have the treatment earlier in the year because it can take up to five weeks. It was a nagging injury, but he seemed able to play through it and did not want to miss such a large chunk of the season. Now that he's missing this week's ATP Finals as he's recovering from an emergency appendectomy, it's time to put this year behind him and start getting as healthy as possible before the next Australian Open. 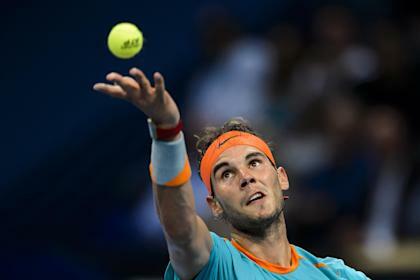 The Associated Press confirmed with Nadal's doctor that the treatment will start next week. The doctor told the AP, "we are going to put cells in a joint in his spine." His troubles started during the men's final at the Australian Open in January, which he lost to Stan Wawrinka. Nadal, 28, went on to win at Roland Garros, but that would be the only highlight in his year. He was stunned by teenager Nick Kyrgios in the round of 16 at Wimbledon, then missed the remainder of the summer with a wrist injury. It was expected that his wrist would heal in time for the U.S. Open, his coach said. Otherwise, the back treatment would have occurred during the summer. He planned to play in the ATP Finals this week, but was again forced to sit out after last week's appendectomy. Next week's treatment will be similar to stem cell treatment he had on his knee last year, his doctor told the AP. He should be back to training in early December.